Suppose we seek to minimize the function subject to the constraint that . The function we seek to maximize is an unbounded plane, while the constraint is a unit circle. In Post 1602 we setup a Lagrange multiplier approach to solving this problem. 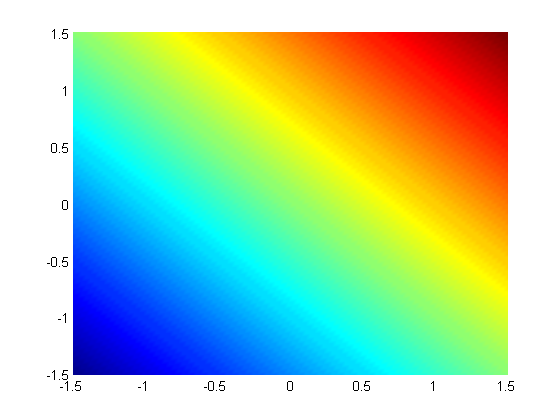 Today, we use the builtin function fmincon in Matlab to solve the same problem. We plot these two functions here. coordinates, then convert those coordinates to x,y cartesian coordinates. then we plot f(x1,y1). the original function, provided that the constraint is met! % function for the nonlinear constraints. % inequality contraints, and the equality constraints. fmincon takes a lot of options. We define all of them here, even though in this example we do not have any linear inequality or equality constraints, and we don't define bounds on the solution. It is necessary to put these empty placeholders in the fmincon call, however, so that it knows what the nonlinear constraints are. are satisfied to within the default value of the constraint tolerance. violation, 2.398637e-011, is less than options.TolCon = 1.000000e-006. Note the warning about the algorithm change. 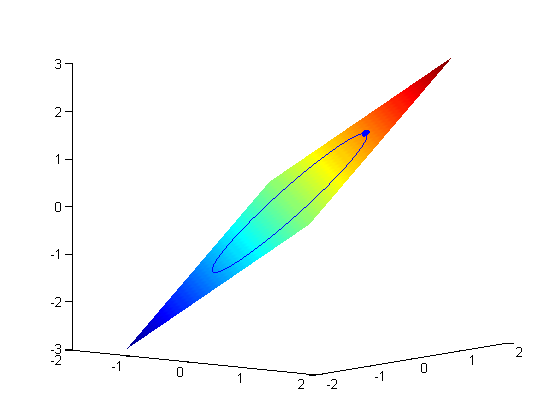 Matlab automatically detected that it could not use the default algorithm because of the nonlinear constraints. Matlab also automatically selected a better algorithm for you. There is a lot of output, that mostly tells us the function worked as expected. Note that the solution above is not a global minimum. There is another solution at the bottom of the circle. Let's try another initial guess. and constraints are satisfied to within the default value of the constraint tolerance. This is the global minimum (by inspection). the built in function fmincon is more flexible than what we did in Post 1602 since it includes inequality constraints. Of course, that flexibility comes at some cost, you have to know the expected syntax for each kind of constraint. But that is easy to find out with the Matlab documentation.